So the Turkish foreign exchange crisis is all over the news. But the Argentine one is less conspicuous in the international media. Turkey’s economy has had many similarities with Latin American economies over the years, in terms of the incomplete process of industrialization, and the types of crises associated with neoliberal reforms over the last three decades. 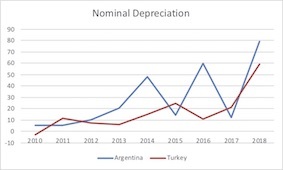 Note, however, that the Argentine nominal depreciation has been larger than the Turkish (the same is true if you go back to the previous big crisis in both countries in the late 1990s and early 2000s, respectively) and one should expect more coverage (perhaps Erdogan has worse press than Macri, but the authoritarian credentials of the latter should not be dismissed; neither the neoliberal ones of the former, I might add). "For nearly 10 years now, the flood of cash from global central banks has financed shopping malls in Istanbul, booming cities in China and 100-year bonds in Argentina. Today, many of the malls are empty, property developers in China are riddled with debt, and Argentina has just submitted to a bailout from the International Monetary Fund." "A country runs a current account deficit if it takes in more money — in investments and trade — from foreigners than it sends to other countries. That leaves the country at the mercy of international investors to keep it afloat financially, and those investors could find other markets more enticing — particularly when emerging markets see their currencies lose value. That is precisely what forced Argentina to go to the I.M.F., the first major emerging market to take such a step during this period of uncertainty." 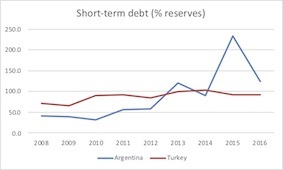 However, as I noted on my earlier post on the Argentine situation, while I do think that current account positions are the relevant fundamental (the other would be international reserves) for a currency crisis (and that fiscal positions are the result not the cause of a crisis, since they are in domestic currency for the most part), it worth noting that the Turkish situation is not, at least looking at recent data, particularly bad. 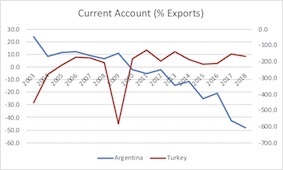 Note that there is a secondary axis for the Turkish current account as a share of exports (the right hand side one), and that Turkey has a much larger deficit with respect to exports than Argentina, but not one that is deterioration drastically (these are based on IMF estimates, btw). This suggests that the current account, even though it is crucial in the long run, is probably not driving the crisis (as I noted in May, I still don’t the current account is the cause of the crisis; same post as above, btw). The fact that this is a global phenomenon (the depreciation of currencies of developing countries) suggests that the hike of the interest rate in the US plays a role. It seems also that the financial deregulation and the financial position of some developing countries explain why they are having more trouble than others (e.g. Brazil, which is in the middle of a serious economic and political crisis, but sitting on top of US$ 380 billion in reserves). I haven’t found more recent data (this from the World Bank goes only to 2016), but the graph below shows the short-term debt to international reserves ratio; the reverse of the Guidotti-Greenspan rule). Clearly the ratio has been growing in both countries (mildly in Turkey) and is higher in Argentina. Argentina has also increased its debt exposure in dollars, and somewhat incredibly the central bank has announced that it will retire debt in pesos, and will use precious reserves in dollars for that (apparently with support from the IMF). This suggests that they are clueless about the causes of the crisis. The only solution at this point is higher interest rates (and in domestic currency to reduce demand for dollars) and significant restrictions on the foreign exchange market.